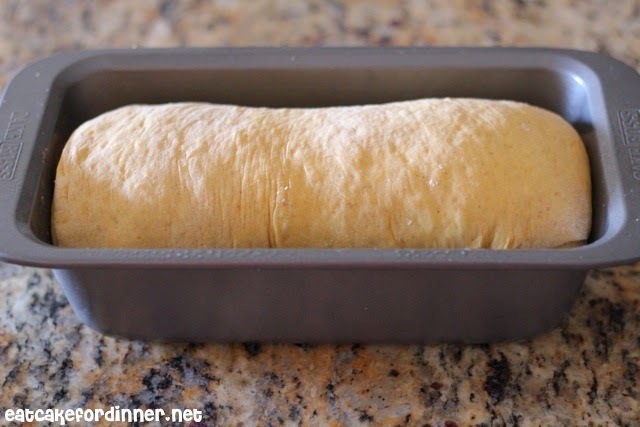 Today, I am sharing one seriously amazing bread recipe with you. This bread needs to be made by every single one of you. Like now. 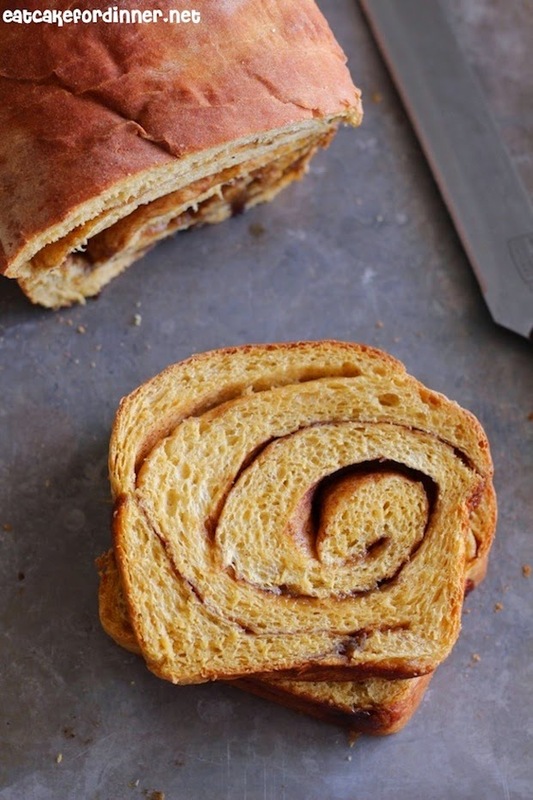 This is such an impressive looking bread with that cinnamon swirl, but guess what? There is very little hands-on-time thanks to the bread machine. Throw all the ingredients into the bread machine, turn it on the dough cycle and let it take care of all the mixing, kneading and rising while you sit back and relax. 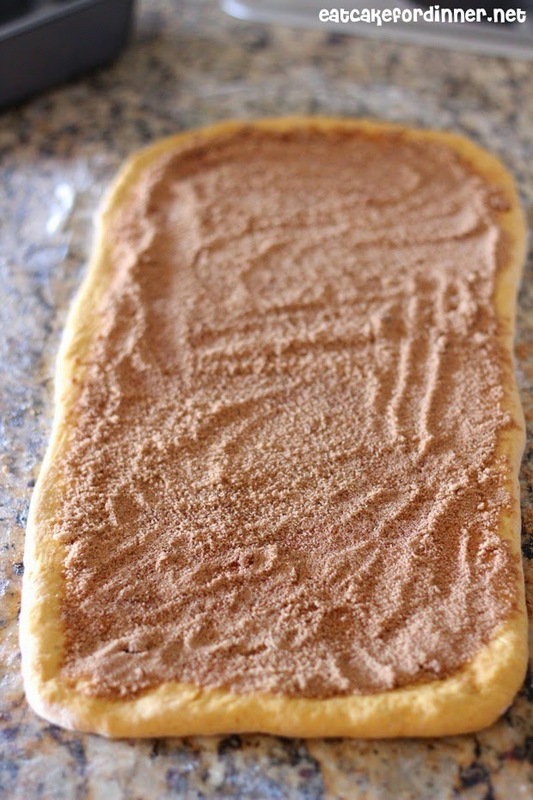 Once the dough cycle is finished, you punch down the dough, roll it out, top with butter and cinnamon sugar mixture, roll it up, put it in a pan, rise again and bake. BAM . . . now it is time to devour this amazingly soft and tender bread. Although it doesn't taste much like pumpkin, it does have outstanding flavor. My secret to making amazing bread from a bread machine is to take it out after it has risen and bake it in the oven. The crust will be much better that way and no one will have any idea it started in a bread machine. Of course, if you don't have a bread machine, you can always make this using a stand mixer or by hand. We enjoyed ours plain, but it would also be amazing with some Cinnamon Honey Butter or Coconut Oil Honey "Butter". It tastes like cinnamon roll bread and it is GOOD. Don't be surprised if it disappears within a few hours. ¾ c. canned pumpkin puree, room temp. Add ingredients to bread machine in the order recommended by the manufacturer. The following is how I prepared mine. Add pumpkin, water, warm milk, vegetable oil, brown sugar, salt, nutmeg, cinnamon and egg to the bread machine pan. Add the flour. Make a well in the top of the flour and add the instant yeast. Turn the bread machine on the dough cycle and let it do all of the work (my dough cycle takes 1½ hours). You will want to check it at first while it is mixing, to make sure you have enough flour. The dough should be slightly sticky to the touch, but will stay in a ball as the bread machine mixes. I used exactly 3 cups of flour and it was perfect. If your dough is way too sticky, add a little extra flour, but don't over-do it. Roll up tightly, beginning with the short end and pinch end together to seal. 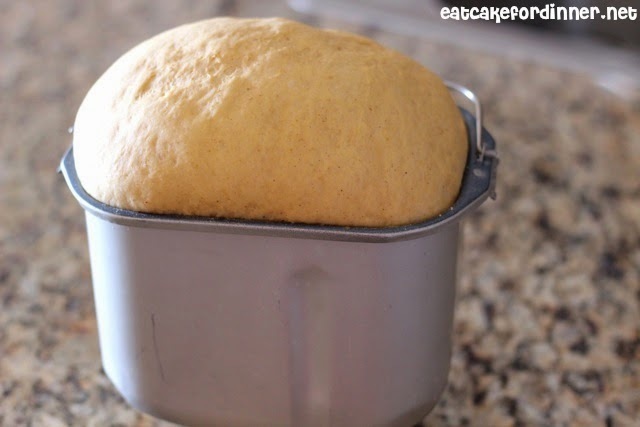 Place in a greased 9''x5'' bread pan; cover with a kitchen towel and allow to rise until almost doubled. Preheat oven to 375 degrees and bake for 30 minutes. Tent with foil for the last 10 minutes to prevent the crust from browning too much. If you tap on the bread, it will sound hollow when it is finished. When finished baking, run a knife around the edge of the pan and remove bread to cool. Slice and enjoy. I might have to make this. It would make some great french toast!!!! YUM! I will add it to my list of things to make :) I have some pumpkin in the fridge right now so I am super excited to try it. It would make way good french toast! Thanks. Yay!!! I am so glad you liked it. I want to try french toast next time too. 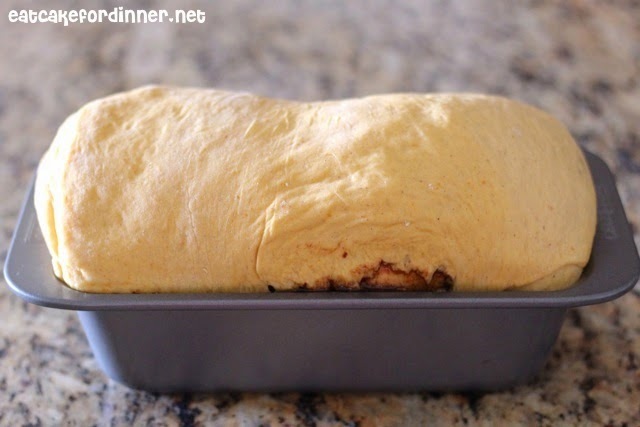 I love making homemade bread and this looks fantastic! The pumpkin and cinnamon are a great combination!